Let it snow! !...just not on the roads. My friends and I are famous....sorta. On January 27, 2008 Gordon B. Hinckley, President of the Church of Jesus Christ of Latter-day Saints died at the age of 97. "My beloved brothers and sisters, I am pleased with the opportunity to speak to you. I thank each of you for your prayers in my behalf. I am so very deeply grateful to you. In my 49 years as a General Authority, I have spoken well over 200 times in general conference. I am now in my 97th year. The wind is blowing, and I feel like the last leaf on the tree. Actually my health is quite good, despite all the rumors to the contrary. Skillful doctors and nurses keep me on the right track. Some of you may go before I do. However, with my age in mind, I wish to give you my testimony of the basic truths of this work." "We look forward to seeing you again next April. I’m 97, but I hope I’m going to make it." In June 2004 President Hinckley was awarded the Presidential Medal of Freedom, the nation's highest civilian honor, by President George W. Bush. He was among a handful of others to recieve such honor that year. Others receiving this honor in 2004 include: Other 2004 honorees include journalist Robert Bartley, politician Edward Brooke, historian Vartan Gregorian, National Geographic Society Chairman Gilbert Grosvenor, cosmetics mogul Estee Lauder, actress Rita Moreno, ophthalmology researcher Arnall Patz, journalist Norman Podhoretz and economist and banker Walter Writon as well as actress Doris Day, golfer Arnold Palmer, Pope John Paul II . 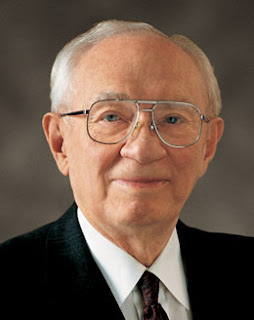 "As the 15th president of the Church, leader of more than 12 million members, Gordon B. Hinckley met and greeted heads of state abroad or at home. And he ventured where no other church president had, on the national media scene. 'Mike Wallace of "60 Minutes" said he asked, "President Hinckley, would you, is it conceivable that you might be persuaded to do a profile for 60 Minutes, of yourself? He said, 'I see no reason why not, Mike.'" 'A couple of years later he was the guest on "Larry King Live." I will miss our dear Prophet. Through the years of his service to the LDS Church I join millions who have grown to love and admire this man of God. We will also miss him greatly. But he has been reunited with his dear wife, Marjorie Hinckley. He had one heck of a life, and will be missed. I remember attending a parade in Salt Lake City a couple years ago. He was in that parade. I recall many of the people watching the parade stood as he went by as they took off their hats. Today teenagers from all over our State are wearing their best clothes in honor of him. I don't know if mine decided to do that or not. They left before I got up. We met him in the mission field. He was so inspiring then and was today. We will miss him but are happy to know he will have a great reunion. Even though I don't know much about him, I am sorry for your loss with his passing. My prayers goes out to his family, and well...everyone in Utah, actually. Actually, he is missed by people all over the world...not just Utah.